Bottlenose dolphins are sturdy genus Tursiops marine mammals that are made up of three separate species. These species are the common bottlenose dolphin (Tursiops truncatus), the Indo-Pacific bottlenose dolphin (Tursiops aduncus) and the Burrunan dolphin (Tursiops australis), the last which only came to light as a species in autumn 2011. The "bottlenose" part of their name is a tribute to their stumpy beaks. Common bottlenose dolphins' physiques tend to be pale gray, deep gray, greenish-gray or black on the edges. Their contrasting stomach areas, however, are white. Their undersides often are slightly pink-tinged, as well. Aging specimens occasionally feature darker blotting on the edges and lower portions of their bodies. Color-wise, Indo-Pacific bottlenose dolphins share a lot with their common bottlenose kin. The upper sides of their bodies are either deep gray or grayish-blue. Their limbs deepen in color when compared to the rest of their forms. Indo-Pacific bottlenose dolphins have grayish-white or yellowish-white stomachs with pink undertones. Also like common bottlenose dolphins, they frequently have dark speckling on their lower portions, but this usually depends on where they live and their specific stage in life. Burrunan dolphins are a new concept in the bottlenose dolphin world, although the notion of different types of dolphins in some Australian waters existed previously. They, like common bottlenose and Indo-Pacific bottlenose dolphins, have several different colors on their bodies. The multi-colored elements of Burrunan dolphins' bodies are white, medium gray and deep gray. The memorable color styling of bottlenose dolphins, as with numerous fellow cetaceans, is known as "countershading." Countershading serves handy camouflage purposes. 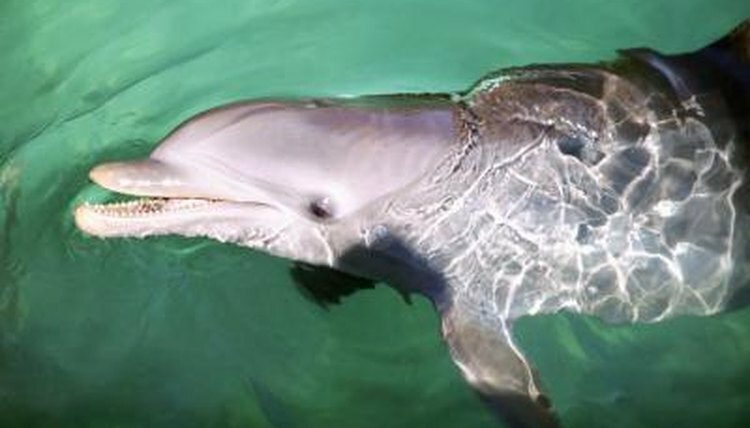 The upper portions of bottlenose dolphins' bodies are darker, while the lower portions are markedly paler. Animals that look up to swimming bottlenose dolphins perceive their pale stomachs as intermixing with the lightness of the sky, while animals that look at them from higher perspectives may confuse their bodies with the rest of the deep blue aquatic scenery. This type of coloration assists in keeping bottlenose dolphins inconspicuous -- both to dangerous predator threats and the prey animals they target for their meals. Countershading camouflage is in no way exclusive to the cetacean world, however. Not only do various types of fish have countershading, some varieties of birds do, as well.